Laura Sansone is a designer, educator, and "student of life" who serves her local community and environment with her holistic approach to design. Her Mobile Textile Lab, a small cart on wheels, is a regular fixture at several New York City farmers' markets where she teaches interested bystanders how to create all-natural dyes using the abundant seasonal produce at hand. 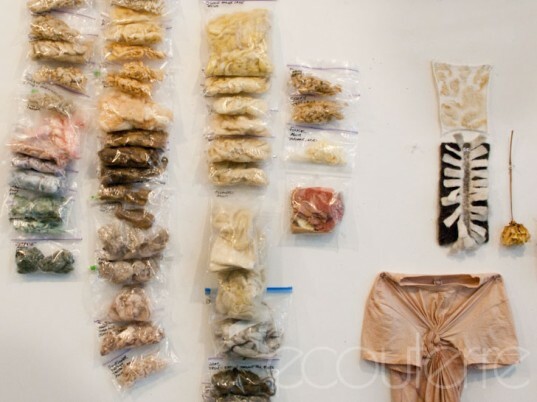 Ecouterre paid a visit to Sansone's Plattekill, NY, studio to learn more about the relationship between food and clothing and how nature informs her slow-fashion techniques. Despite its clean, modern lines, Laura Sansone’s upstate New York studio coexists with its agrarian setting in perfect harmony. The designer’s two Nigerian Dwarf goats roam freely on the 54-acre parcel of land she shares with her partner, Christopher Otterbine, an architect and principal of The Orchard Group. Inside the eight-year-old dwelling, equal parts personality and creativity abound, from collage paintings by Sansone’s father to a talking cockatoo who animates the space. Sansone relies on her immediate environment, preferring to fuel her local economy rather than some anonymous corporation. Instead of looking to exotic destinations for her materials, Sansone relies on her immediate environment, preferring to fuel her local economy rather than some anonymous corporation. She concocts her own natural, plant-based dyes, in fact, from flowers and berries she encounters on her walks or agricultural scraps from her neighbors. Each month brings a fresh palette of colors from the changing foliage, providing Sansone with a bounteous supply of inspiration. Sansone learned many of her techniques from talented craftspeople who still socialize in guild-type groups on a regular basis. Perhaps one of her best finds is the Hudson Valley Sheep and Wool Company, a women-operated mill that derives its raw fleece, yarn, and knitwear from a 100-strong flock of sheep. Sansone is committed to contributing to an economy that’s built on both environmental stewardship and community. But her efforts to stay local go beyond a desire to market herself as “green” or “sustainable.” Sansone is committed to playing an active role in an economy that’s built on environmental stewardship, artisanal traditions, and community. And despite its regional outlook, her model adds an exciting dimension to a the growing sustainable-fashion movement worldwide. Sansone lives and works out of a modern, low-lying dwelling that she and her partner, Christopher Otterbine, constructed with the help of Maryland Institute College of Art students eight years ago. Sansone's two Nigerian Dwarf goats roam freely around the property. She sometime shares fresh produce from the garden with her four-legged friends. Every aspect of Sansone's home studio is infused with creativity and personal history, from collage paintings by Sansone's father to the curtains she stitched by herself. Sansone moved her chatty cockatoo out of the room so we could talk uninterrupted. For lunch, a simple yet visually enticing Tapas-style spread. A tapestry of felted scraps from the Hudson Valley Sheep and Wool Company serves as a bedspread. It was a collaborative effort, first coalescing at a Parsons The New School for Design block party this past spring, then approaching completion at the DUMBO Arts Festival in Brooklyn. One remaining patch waits to join the larger tapestry. Sansone divides her time between teaching at Parsons, running the Mobile Textile Lab, and working on her own designs in her studio. Many of her plant-based dyes are a result of meticulously documented experiments. Sansone is currently working on an "urban dyer's almanac" that will be available online. A mannequin pits contrasting textures of cotton and wool. The neighboring Hudson Valley Sheep and Wool Company sells yarn, dyes, raw fleece, and knitwear both on-site and at the annual New York State Sheep and Wool Festival. The women-operated farm has a flock of over 100 Icelandic and Shetland sheep. Sansone frequently drops by the mill to stock up on raw materials for herself and her students. Plants such as the American pokeberry, a native but invasive perennial, provide great sources of dyes. Morning glory is another ample feedstock for dye, with colors that vary according to the acidity of the soil and medium. Fleece can be dyed before or after it's spun into yarn. Sansone learned to spin from Bonnie Warwick, who works at the Hudson Valley Sheep and Wool Company. Warwick meets regularly with a klatch of local spinners and knitters. Made in Vermont, Sansone's spinning wheel is another testament to her commitment to local manufacturing. Her yarn is part of a closed-loop system: Fleece from the Hudson Valley is handspun, plant-dyed, and can be composted after use. A visit to the Hudson Valley Sheep and Wool Company isn't complete without a meet-and-greet with Ranger, the Great Pyrenees who helps keep operations in order.